In Holland, a third of all short journeys are by bike. Hayling is compact, and just as flat, so we ask why can’t Hayling go Dutch too? Many people dismiss the Dutch experience because “they’re all cyclists”. But in reality, car ownership is about the same as the UK, and public transport is as good or better. It’s true that there are more bikes than people, but they aren’t flashy or fast, they’re just very practical, comfortable, everyday ‘utility’ bikes. Many of them are step-through, so very easy to get on and off. And many are e-bikes. And they mostly cycle in everyday clothes, without helmets or hi-vis clothing. Are they mad? No, they’re not – because of one huge difference with Britain. 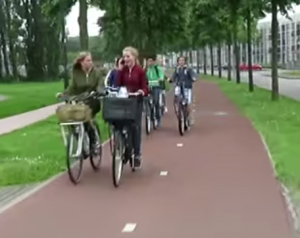 The Dutch have invested in safe, traffic-free cycle paths everywhere. They’re smooth and all-weather, so when you get to school, work or play, you’re clean. Safety trumps everything. Most urban streets have 20 mph limits. Average bike speeds are about 8 mph, with e-bikes only a bit faster. But it’s still 3 or 4 times faster than walking, and of course, it saves time because it’s door-to-door. A few Dutch people might be dedicated cyclists, or intent on saving the planet, or keeping fit through gritted teeth. But most cycle because it’s just easier, quicker and healthier than the alternatives, and parking is easy. 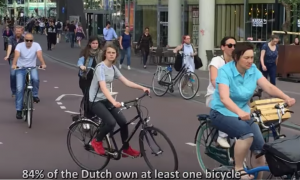 A quarter of all Dutch people cycle daily. Three-quarters of secondary school-kids cycle to school. You can see videos of Dutch cycling on our website, and at youtu.be/pDlmn-Ipdns . So could we do that in Britain? Well, the government thinks so. It published its Cycling and Walking Investment Strategy (CWIS) 18 months ago, and it makes the clear case for investment, on the grounds that cycling and walking are good for us, our physical and mental health, our community, and for the planet. But apart from London, Manchester and a few favoured cities, it hasn’t yet put its money where its mouth is. And nor have Hampshire or Havant councils. In Havant, we have three bits of good news. 1) We can now officially cycle traffic-free all the way from the bridge, through Langstone, to the Langbrook Restaurant. And the next phase will continue under the A27 to Tesco and beyond. Unfortunately, we couldn’t persuade the council to give us cycle priority and a raised table across The Mallards and Langbrook Close, so you have to be careful, but there are dropped kerbs and warning signs. The large tree in the middle of the pavement may not be a long term issue. 2) We can now cycle traffic-free from Havant all the way to Havant College, and on to the beautiful Hermitage Stream cycle path beyond. But compare these paths to Holland. They’re not in the same league. Worse, compare them to the nightmare of cycling from South Hayling to the bridge. Either fighting with traffic on narrow, busy roads, or getting plastered with mud down the Billy Trail. The Dutch just would not accept that. Hayling deserves Dutch quality smooth, all-weather, traffic-free cycle paths to link every part of the island, that people love, rather than endure. 3) So the third bit of good news is that Havant Borough Council is starting work on Havant’s Local Cycling and Walking Infrastructure Plan (LCWIP). Cycle Hayling will be pushing for that to include Dutch quality paths, and Haylink, Hayling’s North-South Cycle Link from the Lidl roundabout to the bridge, an everyday cycle path for commuting and leisure, for our kids, our grandparents, and everyone in between. And for the paths to meet our ‘Smooth the Path’ criteria for all weather hard surfaces. It’s a long term plan – they won’t be delivered next year, maybe not for several years, but gradually over the next 10 years. Send your Local Plan 2036 comments to the council before March 18th, especially on cycling, and how it will deliver on Haylink, and on ‘Smooth the Path’.